We’ve added a new way to get around in the app: the Sidebar. The Sidebar allows easy access to any other area of the app with just a swipe and a tap. We also added easy access to app settings and quick photo from the Sidebar as well. To reveal the sidebar, just tap the menu button or swipe the navigation bar from wherever you are in the app at the time. To take advantage of the larger screen, we’ve added an all-new Panels interface for the iPad which allows for viewing a lot of information on your blog all at once. Panels can be moved around and resized so that you can view your content however you’d like. You can also remove extra Panels that you don’t need anymore by dragging the entire Panel stack to the right. In the post setting tab, you’ll now see an option for setting the post format for your posts. 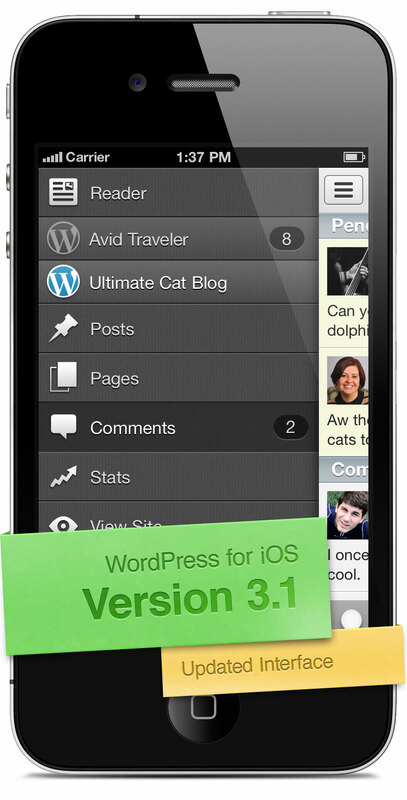 The app will check with your blog to get a list of post formats that your theme supports. You’ve asked them and here they are! We took the great Quick Photo and WordPress.com Reader features that were already in the iPhone app and made them available for the iPad. Hungry for more stats? We’ve added a new stats view that contains all of the same data that you see in your WordPress.com or Jetpack stats. When viewing a post on the iPad, you’ll now get a nice preview of the post including formatting and images. Use the new Friend Finder in the WordPress.com Reader to connect up to Facebook or Twitter to find your friends that are blogging on WordPress.com. Nearly all areas of the app support landscape orientation now, including all of the tabs in the post editor. A no brainer. We added buttons on the Sidebar to view your site as well as a Dashboard link so you can access your plugins, widgets, etc. In addition to all of this great new stuff, we also made many reliability and performance improvements to the app.